My hope is to have Rollo ready for the conVENTion. His head is completed, his script is completed, and his body is ready. But there is the control panel. Many of the jokes depend on features on a control panel I designed for on his body. There will be more simulated controls. Switches, lights, etc. But I don't have time to finish it before hitting the road for Kentucky. One of the problems is that a gas can wasn't designed to have electronic components installed on it. Another is that the inside of a vent figure body doesn't need wires and connections getting in the way of a headstick. 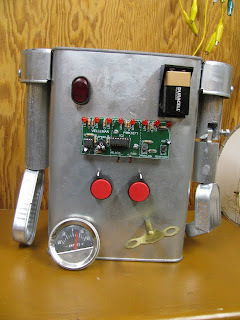 The original plan was to make the control panel itself a self-contained component that I could simply bolt to the body. That's still a better idea, but I didn't have time to build it. The gauge won't stay in place. Nothing wants to stick to the aluminum paint that coats the body. The light panel assembly is fragile. It doesn't want to work when bolted in place. And my bench technition skills are rusty and impaired by the vision and motor skills I surrendered to a stroke earlier this year. It can take me a half hour to get a nut started on a bolt. Or hit the right spot with a soldering iron. Frustrating. Oh, well, whatever is ready goes with me. After all, that's what prototypes are for.